In 1978, the Man of Steel made audiences around the world believe a man could fly in Richard Donner's Superman, thanks to Christopher Reeve's iconic-making performance and Gene Hackman's memorable role as Lex Luther. Celebrating the film's 40th Anniversary, Warner Home Video brings the classic film to 4K Ultra HD with a stunning Dolby Vision HDR presentation, a reference-quality Dolby Atmos soundtrack, and the same set of supplements as the Blu-ray. Must Own! For most of the 20th Century, Superman has played a distinctive role in American history, symbolizing the ideals the nation has so valiantly stood for. Since his inception during the 1930s Depression era, the super being from the planet Krypton — technically making him an immigrant to the country, which is one of many aspects academics love discussing — has become a deeply rooted cultural icon. Even his outfit is reminiscent of the U.S. flag. He serves as a reminder of what humans are capable of when working together toward a common goal. And he pops into our collective consciousness when he's needed most, when the country and the world seem bleakly insecure and anxiously uncertain due to catastrophic events which affect all. Towards the end of the tumultuous 1970s, especially after the President embarrassingly resigned from office and a disastrous conflict in Vietnam finally came to a close, The Man of Steel was called upon to basically lift the spirits of the American people. Or at least, he was in a strange cultural episteme of unconscious desire which of course was not openly expressed by the public. I won't go any deeper with this idea, so I'll just write that from a historical standpoint, it's curious to see a sudden interest in the Superman mythos (and superheroes in general) at the end of some very troubling times in the U.S. As if coming from an unspoken need to remember the country's core values remain strongly intact in spite of a widespread, distressing unease. 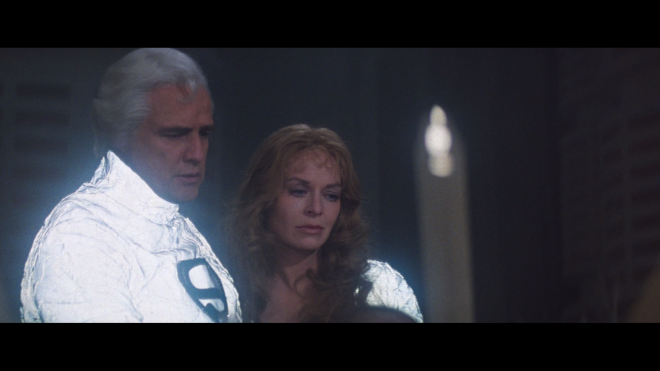 And so it is that in this climate The Last Son of Krypton made his big-screen debut in Richard Donner's Superman: The Movie, a high-concept blockbuster which displayed some of the best and most advanced special effects of the time. Working from a script that famously began with Mario Puzo's 550-page beast intended for a two-part film series, the film doesn't shy away from delivering snide, cynical remarks on the political atmosphere. There was a genuine distrust of government and policymakers, which characters openly express. So much so that we're even given a scene of Superman's motto ("Truth, Justice and the American Way") being almost frowned upon as some kind of hokey jingoism. Rather than address the possibility that viewers might be expressing similar sentiments, Donner fills the screen with grand spectacles of herculean heroism, placing more emphasis on Superman as preternatural Christ-like savior. 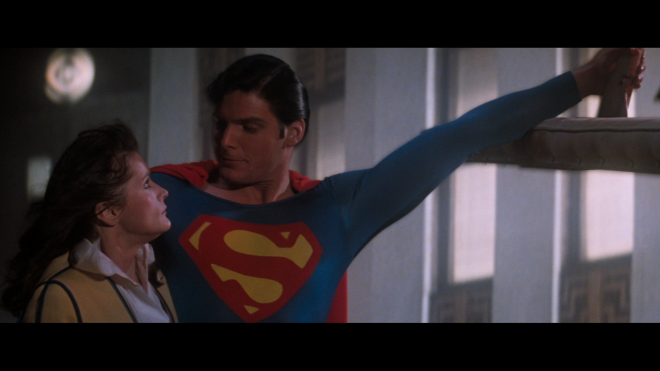 The classic helicopter sequence is a prime example of this — a thrilling eye-opener made believable by the remarkable performance of Christopher Reeve. (John Williams's memorable score also had a great deal to do with it.) He not only dons the glasses and fedora hat, but he actually portrays a wholly different and convincing person as Clark Kent. 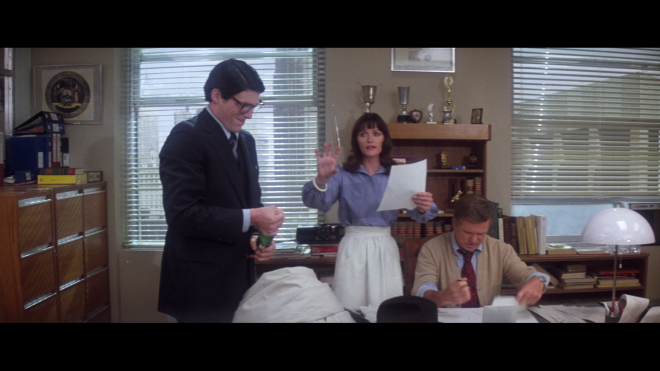 And it's a marvelous display of talent when he maintains strong chemistry with Margot Kidder's Lois Lane in either disguise. Superman's long-time arch-nemesis Lex Luthor (Gene Hackman) also joins the cast, but he's been transformed from the traditional mad scientist to a white-collar criminal, which really only adds to the idea of distrust against suits. 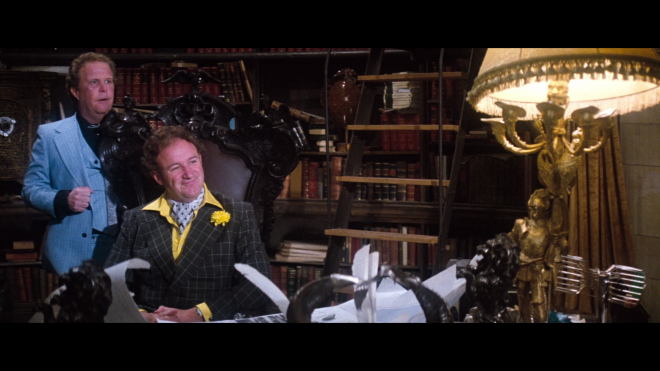 Although he remains a super-genius, the character is also a comical swindler with a penchant for real estate and talking his way out of trouble. What's truly interesting of the plot is Luthor challenging Superman not with power or high-tech weaponry, but as symbolic of corrupt corporate greed to which life is an expendable commodity for the greatest profit return. Predictably, the Kryptonian wins in the end, but with good performances and Donner's strong direction, Superman: The Movie offers a fun and imaginative ride to that conclusion. Warner Home Video brings Richard Donner's Superman (1978) to Ultra HD Blu-ray as a two-disc combo pack with a flyer for a Digital Copy. When redeeming said code via WB.com and Movies Anywhere, it includes the SD, HDX (1080p) and 4K with Dolby Vision and Dolby Atmos on various streaming platforms. 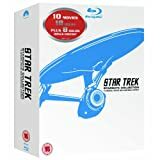 The triple-layered UHD100 disc sits comfortably opposite a Region Free, BD50 disc, and both are housed inside a black, eco-cutout case with a glossy slipcover. At startup, viewers are taken to a generic static screen with usual options along the bottom and music playing in the background. The classic superhero movie saves Ultra HD from disaster, powered by a splendid and highly dynamic HEVC H.265 encode, making it, hands down, the best the film has ever looked on any home video format. Reportedly sourced from a brand-new 4K remaster of the original 35mm camera negatives, the 2160p transfer immediately shows dramatic improvements in the clean, well-defined lines of the unique, arctic architecture on Krypton while practically every minute feature of the buildings and bustling streets of Metropolis are distinct. Individual hairs, the fine stitching of clothing and every object decorating the background is highly-detailed and razor-sharp, even beneath the heavily-stylized and deliberately hazy cinematography of Geoffrey Unsworth. Granted, the elements show their age in a few areas, revealing some blurriness and slightly less than satisfying resolution, most notably during the many dated optical effects, which are understandable and forgivable. 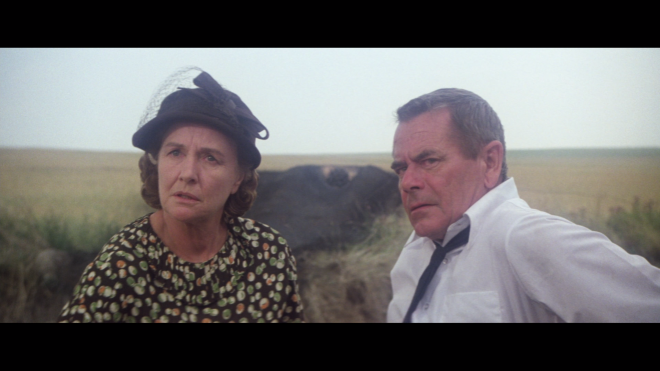 But overall, awash with a thin layer of natural grain that's fairly prominent in some sequences, definition and clarity are superb for this 40-year-old classic. Overlooking that and sticking to what really matters about the UHD format, the 4K video foils another evil mastermind's capitalist plans with marvelous, pitch-perfect contrast, making the entire film seem new and refreshed as if watching it for the first time in cinemas. Whites are significantly brighter with a more intense, luminous pop than the Blu-ray, which is quite apparent in the noticeably tighter, narrower glow of light from various light fixtures and city neon lights. But an even more remarkable improvement is the resplendent specular highlights, supplying the edge of metallic objects and cars with a photorealistic glisten, as well as a shiny sparkle and shimmer along the top of the water while also revealing the fine detailing within the most intensely brilliant spots, like lightbulbs. Likewise, black levels are fuller and inkier, from the clothes and the glossy paint job of cars to various objects throughout the offices of the Daily Planet. Richer, silkier shadows come with excellent delineation within the darkest, murkiest corner, providing the 2.40:1 image with appreciable dimensionality and a gorgeous cinematic quality. It's a sensational, out of this world Dolby Atmos soundtrack that fixes some of the issues of its DTS-HD MA counterpart. Reportedly, the sound design is a brand-new remix from the same remastered OCN as the video, restoring and refurbishing the original sound elements that were switched for new effects on the Blu-ray release. Right from the start, John Williams' iconic score fills the entire soundstage and subtly bleeds into the top heights, generating a beautifully engaging half-dome wall of sound that's consistent. With the added breathing room, the mid-range is stunningly sharp and highly-detailed with room-penetrating clarity during the loudest, most dramatic action sequences and outstanding separation in Williams' orchestration. Without being too overpowering or distracting, the low-end is surprisingly generous with appreciable oomph and a couple room-energizing moments. Meanwhile, vocals are precise and very well-prioritized from beginning to end. Only the commentary track is shared between the Ultra HD disc and the Blu-ray, which ports over the same assortment of bonus features found on the 2011 anthology set. Audio Commentary: Though recorded separately, producers Pierre Spengler and Ilya Salkind lend their voices and knowledge to the first commentary track. Each speaks candidly about the production and its many, now-legendary battles, which is somewhat surprising. Overall, the discussion is clearly from the perspective of individuals from only one mindset, but it makes for interesting listen nonetheless. The Making of (SD, 52 min): A vintage 1978 TV special hosted by Christopher Reeve that thoroughly explores every aspect of the production, from story origins to casting and shooting locations. With light-hearted interviews and plenty of behind-the-scenes footage, the hour-long doc is amusing and well worth watching for fans. "Superman and the Mole-Men" (SD, 58 min): The 1951 feature-length movie that was released in theaters and later turned into a two-part episode for the Adventures of Superman TV series. Premiering a year before the syndicated show, this was America's introduction to George Reeves as Superman and Phyllis Coates as Lois Lane. Although enjoyed more as a vintage curiosity and its importance in the history of a comic book hero, the movie makes a charming watch for devoted followers of the Man of Steel. Cartoons (SD, 19 min): Three terrifically entertaining Looney Tunes cartoons ("Super-Rabbit," "Snafuperman" and "Stupor Duck") are also included. And each one is a total blast! Trailers (SD, 4 min): A small collection of two theatrical previews and one TV spot. Since his inception during the Depression-era, Superman has played a unique cultural role in American history. The fictional comic book hero has conveniently occupied the collective consciousness and imagination of many generations. In 1978, the Man of Steel made audiences around the world believe a man could fly in Superman: The Movie, thanks mostly to Christopher Reeve's believable performance, and director Richard Donner unwittingly set the building blocks for future superhero adaptations. 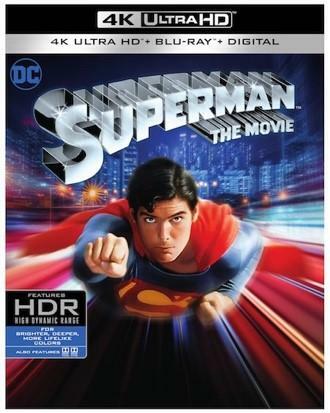 Celebrating the film's 40th Anniversary and the character's 80th birthday, Warner Home Video brings Richard Donner's classic film to 4K Ultra HD with a stunningly gorgeous Dolby Vision HDR presentation and a marvelous reference-quality Dolby Atmos soundtrack. Porting over the same set of supplements from the first disc of the complete Blu-ray anthology, the overall UHD package is Must Own!